Check out our YouTube Channel to see our TS Stick Reclaims in action. The TS Sling Style Stick Reclaim is an excellent system with many options like cart loading and multiple sling arrangements. The Sling Style System provides a gentle way to lower sticks discharged from the unscrambler. 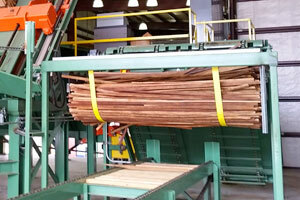 Multi-Sling Systems can be used for separating multiple stick types, or for higher production systems. Sling Systems incorporate fixed 'broken sticker' dropout zones and can be upgraded to include adjustable 'broken sticker' dropouts. 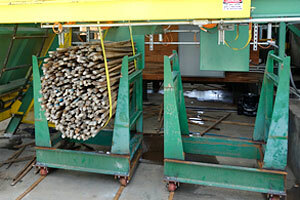 The TS Automatic Stick Reclaim (with auto-cart filling) accommodates the highest end production systems. An integrated Broken Stick Dropout allows for short sticks to be isolated. 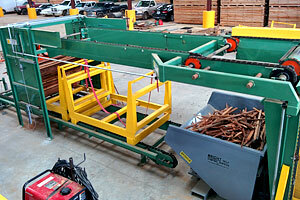 These dropout chainways can be adjusted to the desired reject stick length. 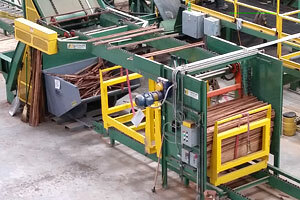 The Auto-Cart Filling System uses a pneumatically operated stick bumper for maximum cart fill. The standard system has room for three carts, but can be elongated to provide room for more. One cart is filling, one cart can be full, and one cart is empty and waiting. Photocells detect cart presence and fill and move them automatically. The broken sticker area uses a tilting hopper for easy dumping.